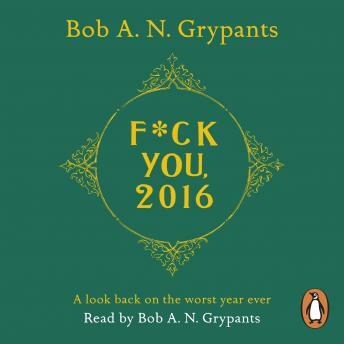 Penguin presents the unabridged, downloadable audiobook edition of F*ck You, 2016 by Bob A. N. Grypants, read by Bob A.N. Grypants. In the year that David Bowie died, Brexit shocked us, 'Hiddleswift' was a thing and Trump trumped, we are all asking ourselves was 2016 really the worst year ever? Find out in this special* commemorative book**. - How was it that politics completely jumped the shark this year? - Compare 2016 with other terrible years in history - is it really the very worst? Featuring some really badly drawn illustrations, this comic compendium will soothe your troubled soul - before you throw it in the bin and prepare your mightily hungover self to face 2017. It has to be better, right?